Most neck and upper back pain is caused by a combination of factors, including injury, poor posture, spinal misalignments (subluxations), stress, and in some instances, disc problems. We associate the neck and upper back together, because most of the muscles that are associated with the neck either attach to, or are located in, the upper back. These muscles include the trapezius, the levator scapulae, the cervical paraspinal muscles and the scalenes. The spinal cord runs through a space in the vertebrae to send nerve impulses to every part of the body. Between each pair of cervical vertebrae, the spinal cord sends off large bundles of nerves that run down the arms and to some degree, the upper back. This means that if your arm is hurting, it may actually be a problem in the neck! Symptoms in the arms can include numbness, tingling, cold, aching, and a “pins and needles” sensation. 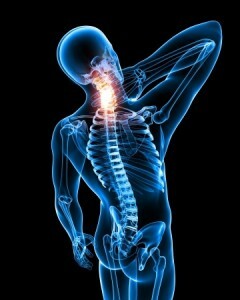 By far, the most common injury to the neck is a whiplash injury. It is a prevalent injury that occurs to people involved in automobile collisions. Whiplash is caused by a sudden jerking movement of the head, either backward, forward, or both, that results in the damage to the supporting muscles, ligaments and other connective tissues in the neck and upper back. It can also occur while playing sports, or in an accident at work. Some whiplash injury symptoms are immediately evident, causing severe pain and loss of normal range of motion in the cervical spine. However, sometimes symptoms of a whiplash injury can take several days or weeks to manifest, thereby making it is easy to be fooled into thinking that you are not as injured as you really are. Too often people do not seek treatment following a car accident or sports injury because they don’t feel hurt. If you have been in a motor vehicle or any other kind of accident, don’t assume that you escaped injury if you are not currently in pain. Get yourself checked out by a good chiropractor. Forward head posture, also known as anterior head carriage, is very common for people who are stooped over their computers all day long. It is one of the most common causes of neck pain, and sometimes causing headaches. It’s easy to get into bad posture habits without even realizing it – an activity as innocent as reading in bed can ultimately lead to pain, headaches, and more serious problems. The basic rule is simple: keep your neck in a “neutral” position whenever possible. Don’t bend or hunch your neck forward for long periods. Also, try not to sit in one position for a long time. 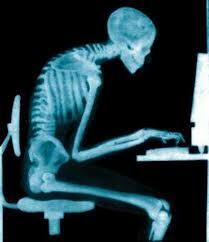 If you must sit for an extended period, make sure your posture is good: Keep your head in a neutral position, make sure your back is supported, keep your knees slightly lower than your hips, and rest your arms if possible. Chiropractors are the experts in healthcare when it comes to assessing posture, and many times can help anyone dealing with postural problems. Misalignments in the neck and upper back area (subluxations) are extremely common due to the high degree of stress associated with holding up your head, coupled with the high degree of instability in the cervical spine. They tend to be centered around four areas: the top of the cervical spine where it meets the skull; in the middle of the cervical spine where the mechanical stress from the head is the greatest; in the transition where the cervical and thoracic areas of the spine meet; and in the middle of the thoracic spine where the mechanical stress from the weight of the upper body is greatest. Signs of spinal misalignments include looking in the mirror and seeing your head tilted or one shoulder higher than the other. If someone looks at you from the side they may notice that your head sits forward from your shoulders. This is known as anterior head carriage or forward head posture – and is very common for people who are stooped over their computers all day long. Left untreated this can lead to long-term postural issues including the development of a hyperkyphosis in the upper back. When most people become stressed, they unconsciously contract their muscles, particularly the muscles of the head, neck and upper back. For most of us, the particular muscle affected by stress is the trapezius muscle, where daily stress usually leads to chronic tightness and the development of knots, sometimes referred to as trigger points. Effective ways you can reduce the physical effects of stress on your own are to increase your activity level through exercise, stretching, yoga, meditation and by deep breathing exercises. When you decrease the physical effects of stress, you can substantially reduce the amount of tightness and pain in your upper back and neck. The intervertebral discs in your neck can herniate or bulge and put pressure on the nerves that exit from the spine through that area. Although cervical discs do not herniate nearly as often as lumbar discs do, they occasionally can herniate, especially following a trauma such as whiplash. Other disc issues common in the neck are those related to arthritis, when the discs start losing their normal height to due to desiccation (lack of water). Chiropractors can diagnose these issues and treat people suffering from pain due to these conditions. Call today for an appointment or if you have any questions!